2011 Ford Mustang GT Daytona 500 Pace Car Shown by appt only This is a heavily optioned ONE OWNER Mustang.Ford ONLY Produced 50 of these special edition cars.This one is #11 of 50.New Condition with only 103(delivery) Miles Factory Options / Window sticker: Mustang GT BaseRapid Spec California Special :	GT black carpet floor mats	GT side tape stripe	Side scoops	Pedestal rear spoiler and decklid badge / decklid tape applique	Unique stainless billet grille and I/P applique finish panel	Unique side stripes and leather seats w/ carbon inserts	Carbon fiber look on doors	8.5 alloy wheels X19	Rear diffuser-style lower fasciaElectronics Package:	Navigation system with 3D and Voice	Compass	Voice activating system for radio and Nav system	DVD/VCD entertainment display screen located in the front MP3 player	Internal HD with 10GB storage	Audio system digital radio	SIRUS Travel Link	Passenger ventilation controls	Ventilation system with automatic recirculationSecurity Package3.73 rear limited slip axleGlass RoofPace car package :	Special Daytona 500 Paint scheme	Ford Racing suspension	Strut tower brace and mufflers	Unique painted wheels	Special interior treatment including specially branded lit sill plates ( Not installed)The last one sold at Mecum auctions in for $330,000 yes i know -WOW! But its true! THIS GT WAS ACTUALLY USED AT DAYTONA SPEEDWAY 5.0 412 HP V8Power Steering and Power BrakesShown by appointment only WE FINANCE/ DELIVER AND SHIP WORLD WIDEPress ReleaseFor the first time in 40 years, a Ford Motor Company car will be pacing the field for the Nascar season-opening Daytona 500 when the 2011 Mustang GT, powered by the all-new 5 liter V8 engine, officially starts the race on Feb. 14 at Daytona International Speedway.Having the opportunity to pace Americas biggest auto race with a Ford icon like the 2011 Mustang GT is truly an honor, said Jamie Allison, director, Ford North America Motorsports. And to have the new 5.0L engine powering the car will be a great way to demonstrate its power and class-leading fuel economy.This latest version of Fords legendary muscle car will be a Race Red glass roof coupe with an all-new 5.0 liter V8 engine capable of producing 412 horsepower, while delivering a class leading 25 mpg on the highway. The one-of-a-kind model will feature a special Daytona 500 paint scheme, Ford Racing suspension, strut tower brace and mufflers, unique painted wheels, and special interior treatment, including specially branded lit sill plates.The 2011 Mustang GT Daytona 500 Pace Car model is one of only 50 special editions that will be built and sold to the public. Everybody loves Mustang, Allison continued. That was evident last year from the fan reaction when we announced it was going to be our new model in the NASCAR Nationwide Series starting later this year. This is just another way to showcase a true American icon in its most natural environment.The last time a Ford served as pace car for the Daytona 500 was 1970 when a Ford Torino GT convertible led the field to the green flag.And while Mustang may be a rookie when it comes to pacing the Daytona 500, its 45-year history is firmly entrenched in racing and winning championships. Mustang captured championships last year in the Grand-Am KONI and SCCA SPEED World Challenge, in addition to leading Robert Hight to his first NHRA Funny Car championship.Another element that makes this years pace car even more unique is that it will be auctioned off for charity before the actual race. 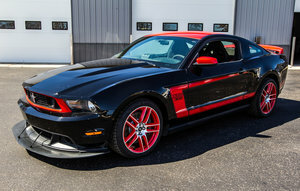 Later this week (Jan. 23), the Mustang GT Daytona 500 Pace Car will be offered at the annual Barrett-Jackson Scottsdale Collector Car Auction, which is taking place in Scottsdale, Ariz. Seven-time Daytona 500 champion Richard Petty, the newest member of the Ford Racing family, will be on site to help hand over the car to the winning bidder.All proceeds over the manufacturers suggested retail price from the pace car auction will go to help cure childhood diabetes through a donation to the Juvenile Diabetes Research Foundation.